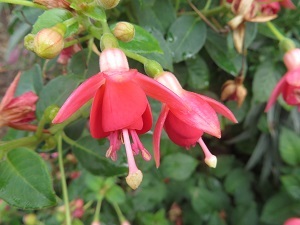 Joy Creek Photo Archive (c) all rights reserved Fuchsia 'Nici's Findling' forms a compact small shrub that has proven winter hardy in the Pacific Northwest. It was hybridized by Hermann Ermel, a German hybridizer, and released in 1985. The lovely flowers have soft pink to peach sepals and dark rose corollas. Summer to frost. 16 in. x 16 in.